Listen, oh you veteran Level 3s out there. You know, us guys that allow organized hockey to exist in this country. Guys that do everything from ACHA to mite. Early-morning house league and midnight butcher games. Here’s what OS asks. First, make an effort on the USA Hockey open- and closed-book tests. Attempt to prepare. Look over the rulebook. And for the open-book, don’t try to wing it, knowing that you can always re-take the exam. Shoot for 49/50, figuring that the USA Hockey test writers habitually throw in a few questions that are simply incomprehensible, even for those with post-collegiate professional education. Yeah, every year OS hears stories from veteran guys failing the open-book on their first try. I’m talking 3s and 4s. And guess what? Those are the same 3s and 4s that simply don’t know the rules on the ice. You know, hot shots in their 20s that think officiating is all about skating, when in fact, that’s really the barest of necessities. Yup, you can program a robot to skate, but try having that tin can make an intentional offsides determination. Enough said. Second request. During your pre-exam study sessions, make a concerted effort to learn the USA Hockey faceoff procedures. How about doing it right this season! And if you’re not sure whether you’re included in this admonition, read on. Last month, OS is about to drop the puck in an end zone faceoff spot during the Wednesday night “B” league. One guy’s got his blade in the white, the other center’s stick is 12 inches off the ice. No response. I figure he’s trying to show up the official. So I do the gentlemanly thing. “You’ve got to wait till I’m ready,” he whines as the puck splats on the dot. “You didn’t blow the whistle,” he pleads, while the offensive center wins the draw to his right point man. “Darn,” I mutter to myself. I’ve just been victimized by my zebra brethren that don’t get the rule. Sure enough, when my partner executes the subsequent faceoff, he waits till the centers are standing on-sides with their sticks in the respective white parts of the dot, and then he blows the whistle. Officials’ faceoff procedures. (USAH Intermediate Officiating Manual). Fellow referees: Do not line up both centers, wait for them to place stick blades in the white and then blow the whistle. Per the Intermediate Manual, officials are expected to conduct a faceoff by dropping the puck within five seconds after the whistle signifying the completion of the line change procedure. Got that? The whistle lets everyone know that the line change procedure is over. 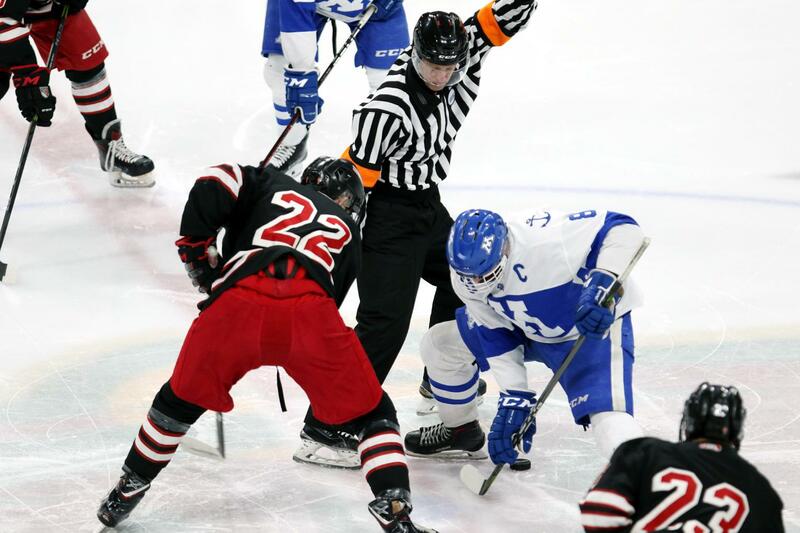 The whistle is a condition precedent to the players getting in faceoff position. Once that faceoff position has been attained, there is no justification for the whistle. In fact, if this were an administrative hearing, I would argue that a good referee gets the players lined up quickly and efficiently and as a result may not even find it necessary to blow the whistle. Radical, I know, but something to strive for. Back to my scenario. Seriously, I apologized to the center during intermission, explaining to him that I understood his confusion since most officials misapply the rule. Still, in classic OS fashion, I educated him about proper faceoff procedures, undoubtedly making him into a better center, or at least a more knowledgeable one. So there you go. Two things. That’s all I ask of us long-time officials this season. Study and execute. Just do that. And be assured, OS is always here to protect the veteran Level 3.